Georgia ARES® has added a mutual assistance team service and protocols to its program. From its website: "Georgia ARES Mutual Aid Team is a volunteer team of highly trained local ARES members that are ready to share their communication skills to help fellow ARES groups across the State and in adjacent states." Its website features a repository of information and YouTube training programs. Please click here for more on the Georgia ARES MAT program. Illinois Section Emergency Coordinator Fritz Bock, WD9FMB, was selected by Jim Dwyer, Vice President of the Illinois Emergency Services Management Association (IESMA) to join their organization, providing liaison to amateur operators in Illinois. "This is a big step towards our common goals for making our services known," said Illinois Section Manager Ron Morgan, AD9I. IESMA is the voice of local emergency management in Illinois. Since 1965 it has been their mission to coordinate the efforts of members in a common cause to help protect the lives and property of those it serves. Check out their website for additional information. 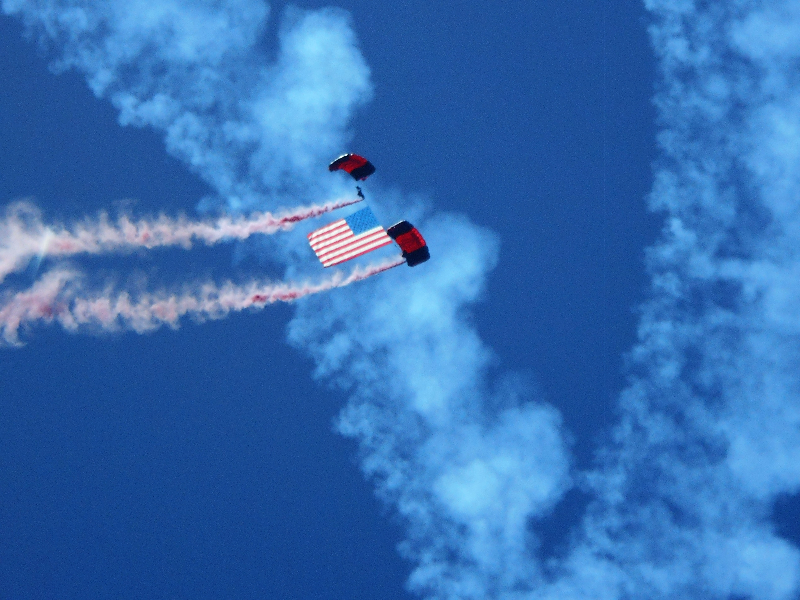 Last year, the Office of Emergency Management in Ocean City, Maryland (OCEM) asked Sussex County, Delaware Emergency Management for assistance at the famous Ocean City Air Show, held over a weekend each year in June. Sussex RACES was asked to provide radio communications support, and the Ocean City EM was pleased with the RACES group's service. The event was managed under the Incident Command System in Ocean City; the RACES operation was conducted under the Operations Section. Last month, RACES was back and better prepared, thanks to lessons learned from last year's operation. The amateur service communications system installation included a Diamond X-50 dual band antenna mounted on a mast near the boardwalk at an elevation of fifteen feet, fed with LMR-400 coaxial cable. The net control station employed a Yaesu FT-7800 dual band transceiver, with a Heil Traveler single ear headset with boom mic. Coverage on 2-meter simplex was good -- five to six blocks on low power for both the net control's radio and all deployed field operators' hand-held radios. A deep cycle battery provided sufficient power for the duration of the event, with no need for recharging. The net control station was issued an 800 MHz public safety radio set to the interoperable channel selected for the air show. This frequency was not the same channel being used by law enforcement, but rather by all the members of the Incident Command team; law enforcement was reached through Operations, which was the amateurs' contact for any issues that may have arisen. The RACES mission was to put "feet on the street" to observe for medical issues, lost persons, suspicious packages and hazardous conditions. Field operators also answered general event questions from spectators. Any situations were to be relayed to net control for relay to Operations on the public safety radio. Net control also had contact with deployed CERT personnel that had been assigned jobs by OCEM. I'm a retired IBM/GE/Air Force worker, turned STEM evangelist in Newport, Rhode Island. During the school year, I teach (as a volunteer) cyber security to middle school kids as part of the CyberPatriot (National Youth Cyber Education Program) competition and then put the same group of kids through a Technician licensing class. (When learning of cyber vulnerabilities, these students understand the critical need for, and develop a keen interest in, auxiliary back-up communication systems and services, including the Amateur service). In the last two years, I've helped more than ten kids get licensed and then linked them up as youth members of the Newport County Radio Club (W1SYE). You may have heard of the ongoing Rockefeller Foundation funded, global initiative of building resiliency. Locally, I'm finding success in promoting Amateur Radio by first having a consciousness-raising discussion on the topic of "communications resiliency." Economic development officials are trying to fashion this region into an attractive "resiliency" center of excellence and as part of their efforts have shown interest in AREDN (Amateur Radio Emergency Data Network) mesh networking, for example. In other efforts, one local city is moving forward with a solar-based "microgrid" and a hydroponic lettuce farm. As our small group of local hams look for potential AREDN node sites atop buildings, I'm finding it easier to work with and gain acceptance from city officials who think in terms of resilience in general as opposed to the traditional selling of the Amateur Radio value proposition to an overstretched, risk adverse EMA director. I'm actively encouraging my local ham friends to begin using the phrase "communications resiliency" when trying to generate interest in the service. The resilience concept seems to propel the conversation beyond the usual preconceived Amateur Radio emergency communications stereotypes. Another related "value prop" that may help drive AREDN tech into the community is by encouraging middle/high school students and teachers who are participating in CyberPatriot and/or software coding to use and deploy services sitting on the mesh network, such as VOIP phones, Raspberry Pis, a Minecraft game server, IP cameras, chat, etc. Elected officials seem to be tripping over one another promoting job-producing, coding and cyber skill building opportunities. A capable AREDN node, powered by 100 amp/hour battery/solar, could be deployed on a school roof for around $750. Small client nodes can go into classrooms for $75. Once school usage ramps up, then it could be the right time to invite the "resiliency" pols and EMA into a mesh-equipped classroom with the message that this capable radio Internet can be all theirs when schools are closed. [Editor's note: Cullen works with fellow Rhode Island amateur Denis Couture, KD1HA. Couture is a retired PD officer and has been working closely with Providence EMA, doing yeoman's work since 2014 on championing the placement of mesh nodes around the Providence area. Cullen popped up in 2016 and started approaching this from the classroom coding/cyber/teacher/economic development side because "I could see the growing political support with this kind of use case." Cullen sees more opportunity for the amateur service: "The National Governors Association met in Rhode Island last week, where Virginia Governor Terry McAuliffe rolled out his #MeetTheThreat campaign -- 'States Confront the Cyber Challenge.' A major element is building a cyber-skilled workforce. For ARRL, this could be met by more hams working with CyberPatriot and its executive director Bernie Skoch, K5XS, and then offering the same, motivated cyber-concerned students a Technician licensing class." (The Newport County Radio Club offers a half price youth membership and gives new licensees a free, programmed HT if they pay for a two year membership). The Rhode Island chapter of Infragard, the FBI-sponsored critical infrastructure info sharing organization, was briefed on AREDN in June to very strong interest. Cullen has an important follow up meeting with a healthcare agency. He strongly encourages amateurs with links to critical infrastructure to join Infragard (it's free and is an excellent place for networking across sectors). Cullen says "This is an excellent time for the Amateur Radio community to be at the table of a governor's cyber task force, offering decentralized auxiliary communication services." Most of us hate paperwork. That being said, anyone who has ever held a position of leadership, be it in the military or in a company, or just from our own personal lives knows that paperwork, especially reports, have to be done. In the Amateur Radio community, everyone knows that to score on Field Day, get a Worked All States (WAS) certificate, or to get a QSL card, you have to do some reporting, even if it is electronic. In ARES, it is no different, and it is perhaps even more important. Here is a scenario: You are lobbying for a new law regarding antenna restrictions or to use radios while driving. One of the selling points may be that the Amateur service can be critically valuable during disasters and emergencies. If you have never compiled hard data on how many operators there are in your area or have signed up for ARES, if you have never logged how many person-hours your area contributes each year to the community, and so forth, then you are just making unsubstantiated claims. Maybe you will have a couple of anecdotal examples, but they don't paint much of a picture. As they used to say in school, "Anecdotes are not data!" So, compile the reports and data now and continually. In ARES, we have several reports that need to be filed, including event reports, monthly reports, and annual reports. Event reports are the ARES Form 1 "Public Service Activity Report" and Form A and B "Simulated Emergency Test Report." These should be completed and filed within a few days of any kind of ARES support for a public service event, emergencies/disasters, severe weather, or even exercises/training and an SET. The Form 1 is very important to fill out as it will help the local Emergency Coordinator and District Emergency Coordinator compile and complete their monthly reports as well as alert the ARRL HQ staff to any high interest events that they may want additional information about; for example, an ARES response to a local tornado breakout. The monthly reports include the ARES Form 2 "Monthly DEC/EC Report" and ARES Form 4 "Monthly Section Emergency Coordinator Report." These reports provide a snapshot of your number of members, how much training you have done, how many operations you supported, and the number of volunteer hours expended during the month. These data are crucial for the ARRL leadership as they give hard numbers to use for spectrum defense, changes to laws, and so on. The ARES Form 3 "EC Annual Report" is similar to the monthly report, but it focuses primarily on membership to help the Section EC understand the capabilities of each district or area in their jurisdiction. All of the reports should be sent to the SEC, though some, like the Form 1, can be sent directly to the ARRL as well. It is the SEC's responsibility (ref section 1.2, ARES Manual, 2015) to make sure the reports are being filed and to ensure that accurate reports are compiled and sent to the ARRL. There are over 70 sections and most are sub-divided to districts and local areas, so you can imagine the nightmare of having just a couple of staffers at ARRL HQ trying to compile reports from every EC and DEC. This means not only do the SECs need to see these reports for their own awareness, but also to compile summaries to reduce the number of reports being sent to ARRL HQ. While most of the reports originate at the EC/DEC level (ref section 1.3 and 1.4, ARES Manual, 2015), if the SEC does not file the section reports or ensure EC/DEC reports are being filed, then the ECs and DECs have little reason or motivation to file their reports. There are even cases where ECs and DECs are not even aware that there are reports or that they are responsible for reporting, simply because the SEC never told them and never asked for any reports. All forms can be found on the ARRL website at http://www.arrl.org/public-service-field-services-forms The ARRL has also hosted some webinars to help explain why and how these forms are used, and how to fill them out. See the ARES Forms webinar archived on YouTube. On the way home from the Spring 2017 West Central Florida Section ARES Meeting, I was running my handheld radio on APRS as a mobile tracker. I received the following text message from someone: "Hey dummy, program your radio correctly." Apparently someone did not like a parameter that was set on my radio and took exception to it. The question I asked myself after the comment had disturbed me was the following: What if I had been a new amateur licensee? If so, I might have become discouraged and bitter as a result of that comment. I might have quit. There is a lesson to be learned from this incident. We in the amateur community should always be civil to one another. This does not mean you cannot disagree, but you can state your disagreement and remain respectful/civil about it. It does not offend me if someone does not agree with what I say or what I do, if it is in a civil manner. Lack of civility is sadly a sign of the times we live in. Far too often today when one states their viewpoint, even when they state it with civility, it is met with rudeness or even with a vitriolic response. In Amateur Radio we should be the exception to this trend and be civil to one another both on the air and in person, as an example to our peers and to the next generation. Another lesson to be learned here is to be aware that sometimes operators have either technical issues with their equipment or procedures (AC hum on the microphone, cracking sounds, wrong parameters programmed on digital modes, improper operating procedure, etc.). It is okay to point an issue out to them if you know what the problem is, but remember to be civil about it, in a positive, helpful way. A new amateur may not have learned all of the proper procedures yet. Talk to them in a respectful manner, preferably off the air. In the case of most people, if you approach them with a modest and humble attitude, they will listen to what you have to say. If I have a problem, I would want someone to tell me, because I may not know about it. One more lesson: We all have our favorite modes of operation and parts of the service we enjoy more than others. Don't put down or demean another amateur's interests. It's okay to invite other hams to join your part of the hobby but if they say no, don't feel slighted. They might on the other hand say yes, but you will not know until you ask. Also, if someone tells you about their favorite mode, take the time to listen. You may decide it is not of interest to you and say "No thank you" and that is perfectly okay. But on the other hand you may say "yes." How do we get more people, especially youth, involved? I am sure this is a question that your local radio club or ARES team has asked many times. There isn't any easy answer because what works in Vanderburgh County may not work in Allen County. But, in general: You must give people and hams something meaningful to get involved with and provide them with a sense of belonging. All too often I have attended club meetings where they read the minutes from the last meeting, read the treasurer's report and of course vote on both. Then it is on to old and new business for a lengthy discussion. This format for a club meeting isn't interesting to the younger generation. They want an environment where they can learn. Limit the business portion, and have hands-on live demos of hardware and software!